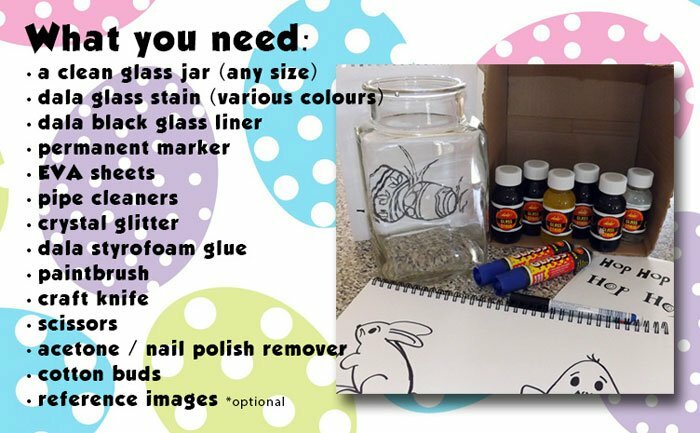 A great homemade gift for the young ones (or the old ones) at home - an Easter jar to keep all your Easter loot in! 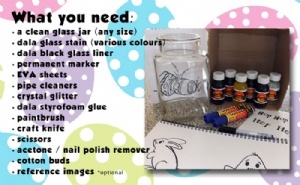 Print some images out as reference for text or graphic elements you would like to paint onto the jar. 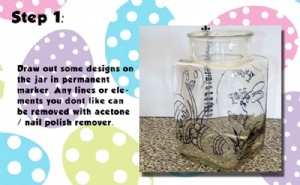 Draw your chosen designs onto the jar using a permanent marker. 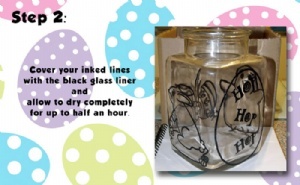 This line work will help guide you when you are ready to work with the black glass liner. 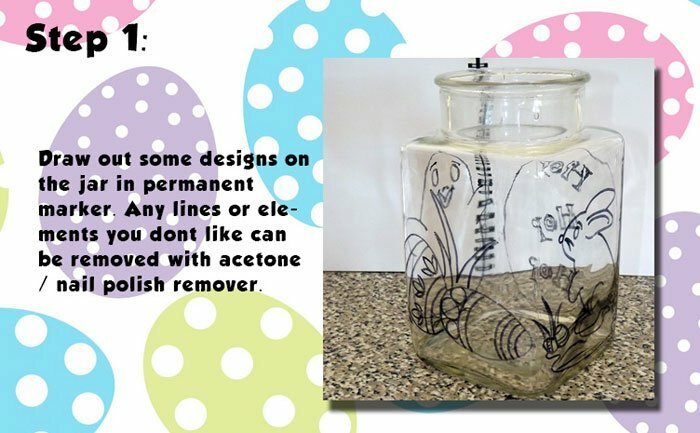 Any lines you don't like can be removed or mistakes can be fixed using some acetone / nail polish remover and a cotton bud. 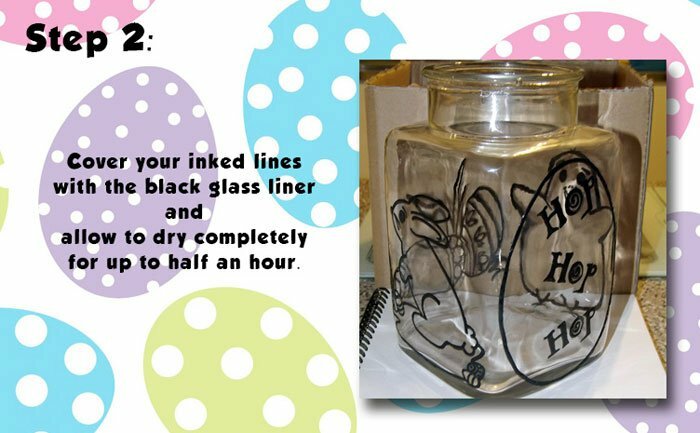 Cover your inked line work with the black glass liner, one side at a time (depending on the shape of your jar) and allow dry for 20 minutes to half an hour before adding the coloured stains. It must be completely dry before moving onto the next step. Neaten up any lines you are unhappy with in your design by removing portions of the liner with a craft knife. Using the soft brush, fill in the lined designs with the stains in your chosen colours. 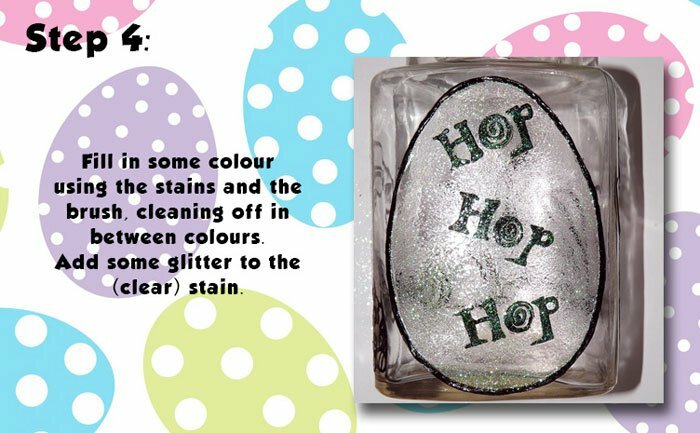 Clear stain holds glitter nicely - sprinkle some of the rainbow glitter onto a clear stained area for some sparkle. Allow the stain to sit flat / horizontally (if possible) so that the colour within the lined areas can dry nice and evenly. 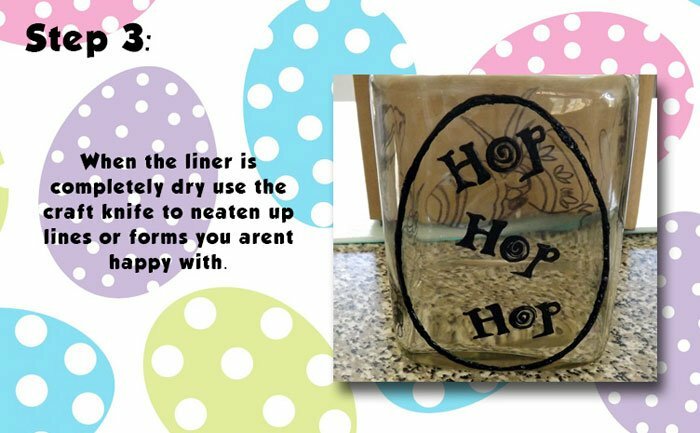 The glass stain should be set and touch dry within an hour. You could stop at this step and enjoy your jar as is. 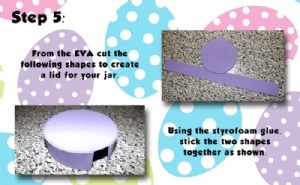 Or you could continue with step 5 and create an EVA foam lid and decorations for your jar. Once all of your designs are filled in with colour, and have dried completely, trace the circumference of the jar by turning it over onto an EVA sheet (we used purple). Cut out the circle shape and set aside. 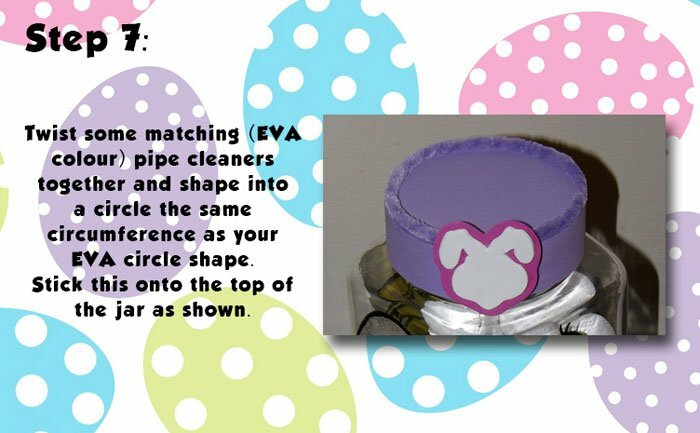 Then, cut a 3cm wide strip (in the same colour EVA sheet) for the depth of your lid and using the Styrofoam glue it down (not too much glue) on the circle shape as shown to create the lid. You will have to hold it in place for a little while, but the glue should hold it after about 5 mins. It will be completely dry after 20 mins. 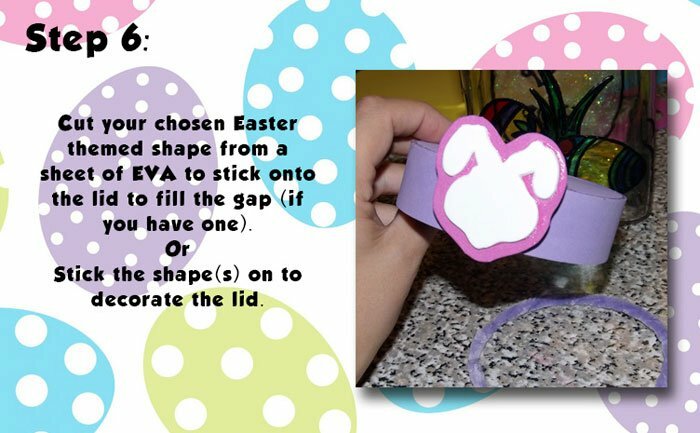 Draw a bunny head, or a carrot or another Easter themed shape on a sheet of EVA. You could stick this down onto another sheet of EVA and cut to create a slim border. 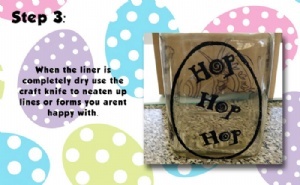 Stick this on the front of your lid to fill in the gap. Twist pipe cleaners together (we used purple) and form a circle. 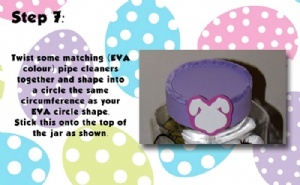 Stick this to the top rim of the lid as a finishing touch. 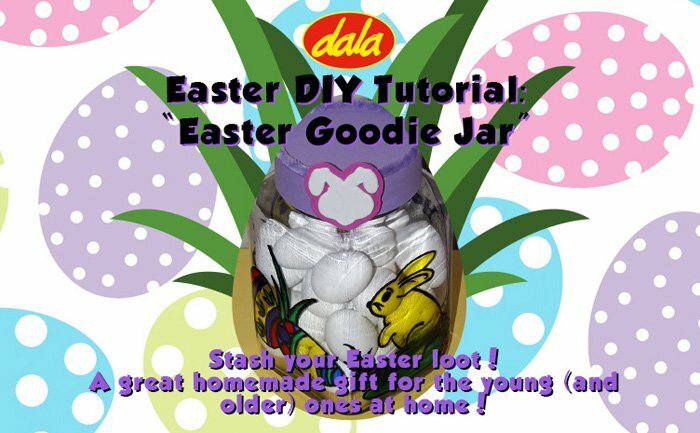 Your Easter jar is ready to be filled with yummy Easter treats! This item has 657 views.